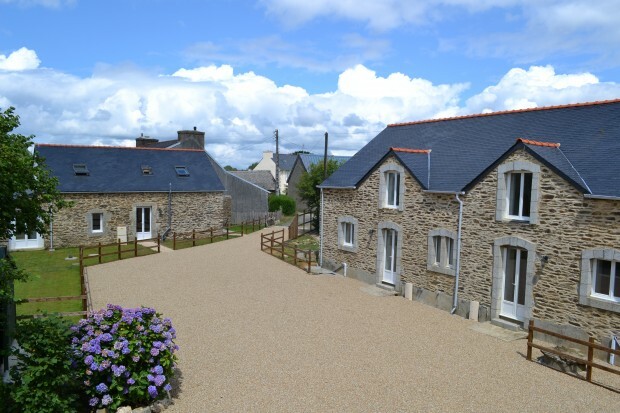 Properties for sale in Brittany, France - AHIB-3-M1491-2914561 Plonévez-du-Faou Area 29530 Exceptional Gite complex: a 4 bedroom farm house, 3 gîtes, all newly renovated with garden, patios, ready to be rented! A professionally designed website with full booking capability is included. It is being sold fully furnished with all new linen, appliances and crockery. The farmhouse includes: an open plan living area on the ground floor with a pellet burner and fully fitted kitchen, the lounge offers comfortable furniture making it homely and inviting. A central staircase gives access to the two open floors, each of which has 2 double bedrooms with new hotel quality beds and linen, and a bathroom between the bedrooms all newly fitted, with shower and bath. On the 1st floor, two double bedrooms and a modern bathroom with a bath.The large barn has been divided to form 2 self contained gîtes which are mirror images of each other. All the accommodations include washing machine, fridge-freezer, tumble dryer, oven/hob and microwave all brand new, all the furniture is new included English TV. It is very seldom to find on the market a property of a so high quality renovation and materials with the contents all brand new.